During the winter of 1988 and 1989, a steel sculpture of unprecedented magnitude reached into the sky as construction workers erected a superstructure on the U.S. banks of Lake Erie. Shining silver towers rose atop their footings and red track began to grace the shoreline. Cedar Point had done it once when they built the Gemini eleven years before, and the Sandusky, Ohio amusement park would do it again. Records would be shattered. New heights would be reached. Old barriers would be broken. 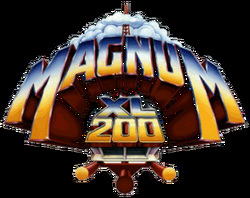 A new era in the existence of roller coasters was dawning and the future of the coaster as we now know it rested on this single steel giant.Magnum XL-200 was its name, and at 205 feet tall and 73 miles per hour, it completely obliterated past records and spawned a new generation of coasters. world's first triple-inversion steel coaster; the aforementioned record-breaking Gemini racer; Iron Dragon, 1987's suspended twister; and the mine train Cedar Creek Mine Ride. So it came as no surprise when Arrow was chosen to pioneer the new breed of 200-foot tall coasters - after all, that same company had introduced the steel tubular-tracked roller coaster to the world three decades before. And once Magnum XL-200 opened on May 6th, 1989, the 200-foot height barrier and 70-mph speed barriers had officially been exceeded through the use of a 5,106-foot long full-circuit coaster. The age of the hyper-coaster, or mega-coaster, had begun. To this day, Magnum retains its popularity by delivering a splendid ride. The ride won the Golden Ticket award for the best steel roller coaster three times in a row, 1998-2000. It was also the 11th best steel tracked roller coaster in 1999 in Mitch Hawker’s roller coaster poll. In 2004, the ride recieved a plaque showcasing the ride as an ACE Roller Coaster Landmark. In 2007, there was an accident on Magnum that involved two of the trains to run into each other. This was not a totally major accident; the back train was only traveling at 10 MPH. Three people went to the hospital for minor injuries and an asthma attack. It was said later by park’s spokesperson Robin Innes that the accident was caused by the heavy amount of rainfall that morning. Magnum's old-fashioned out and back course emphasized the coaster's focus on speed and airtime over banked curves and twister elements and would become the standard type of layout for mega-coasters for the next ten years. Eleven hills and hops in all make up the layout, broken up by three tunnels and a pretzel-like turnaround of two carousel curves. And while riders lift into the sky and soar along the layout, stunning views of the parallel Lake Erie add to the visual experience, with the shoreline of Canada visible far off on the horizon on a clear day. Magnum is also known for its amazing, and sometimes painful, airtime on the bunny hops back to the station. Six six-rider cars roll from the station to coast over a straightaway as lap bars hold thrill seekers in place. The interior-guide wheel Arrow track dips to quicken the pace around a right L-turn to the foot of the lift, and the long journey skyward begins. Magnum's chain carries the boxy white train far above Cedar Point's Soak City water park directly below, at an angle towards Lake Erie. At 201 feet above the footers and a good twenty-and-a-half stories from the sandy ground, the red track tops off, then the chain stops and the thrill ride begins. Cresting the top, a panoramic view of the vast blue waters of the lake and the second hill directly ahead presents itself, but it doesn't last too long before the rails have angled sixty degrees towards the ground. Gravity accelerates the train to top speeds at the bottom of the 195-foot descent, making for plenty of momentum for the climb to the top of the 157-foot second hill. Floating out of their seats briefly, riders are taken over the peak of the first camelback, then the layout curves to the left as the track dives to parallel the shoreline. The train dives straight into the darkness inside of the first tunnel and emerges to crest an eighty foot speed hill serving up airtime aplenty. Magnum XL-200's action goes horizontal in the far turnaround when the track banks to the left for the 270-degree first half of the pretzel element. Another 270 leftward degrees gets the course on track for the return leg, the second half of the out and back layout. The track descends and then hops into the third blue tunnel, completing the hill and then hopping out of the tunnel, straight into a hop tracing around the second hill. Magnum throws another rabbit hop at riders, whipping them over the top, another hop just beside the pullout of the first drop, followed by another. For the final hop, the track ascends in the darkness of the third and final tunnel, dips down, and leaps up once more onto the first brake run. Finally, the train navigates a leftward turnaround, dips and climbs, then a right turnaround leading into the final brake run, with a slight right-hand turn connecting back to the station to end the two-minute experience on Magnum XL-200.